Kimono is not always the same style. We have varieties of Kimono in Japan! Athough the number of people wearing Kimono has been getting smaller in Japan, we can find that many tourists wearing kimono in Kyoto that makes the city more cheerful and beautiful. By the way, we have many kinds of kimono. Some are formal, and some are casual. It’s not decided by the price, but related to the types of cloths and patterns. For unmarried young ladies, Long-sleeved Kimono called “Furisode” is the most formal. The length of the sleeve for Furisode, the most formal Kimono is about 115cm and 95cm for the middle. We wear these in Wedding, Coming of Age Day in January, or formal ceremonies. For married women, it is “Tomesode”, with Black. Mothers of bride and groom or matchmakers wear it in the wedding party. It has traditional patterns stitched with gold and silver strings which express happiness. For men, it is “Kuro-Montsuki” with Hakama. Kuro means black and Montsuki means kimono with 5 heraldries. Hakama means pants. We often see this in the Japanese style wedding as well. Though there is less opportunity to put on Kimono, these types of Kimono is still famous. Both married and unmarried women can wear these. “Iro-Tomesode” is the tomesode with colors except for black. “Iro-Tomesode” with nonblack and 1 or 3 crests is suite for many situation, although one with 5 crets is the most formal one, less opportunity to wear. “Homongi” means “Kimono for visiting”. It is a little bit simplified than Irotome, but still has gorgeous patterns on shoulders and leaves. “Tsukesage” has all patterns upwards, but more simple than Homongi. “Iromuji” is the plain color kimono except for black. The white cloth is dyed in colors. It’s the most useful because we can change the atmosphere by the ties. For example, it’ll be formal when we use ties with traditional patterns, on the other hand, it’ll be casual when we put modern artistic ties. These formal kimonos are made by dying the white cloth, not using the already dyed strings, so that the touch will be soft. If the patterns are traditional, such as pine trees, plum flowers, bamboo, chrysanthemums, orchids, or something, it will be more formal. “Komon” or “ Tsumugi” are casual kimonos. They are suitable to go to restaurants or museums. Kimonos on the pictures are “Tsumugi” It means spinning. The process of making is different from the formal kimonos. First, we dye strings, secondly weave them for Tsumugi. The touch is rough, and the design seems casual and modern. Actually we have one more called “Omeshi”, which is also weaved kimono. The touch is softer and smoother, so it’s thought to be more formal than tsumugi. Nishijin in Kyoto is famous for ties, in addition, they also make “omeshi”. Tokugawa Ienari(1773-1841), shogun at that time liked this cloth. We often wear Iromuji( plain color kimono), Tsukesage, or Homongi for tea ceremonies which means Tsumugi is too casual in this case. They are all soft dyed kimono. As a host for official tea ceremonies, modest color with one crest on back and weaved sashes are suitable. Although there is a tradition, tea ceremony time at “Tea Ceremon Koto” is just a experience so that you will be welcomed to come here in any fashion. Needless to say, casual rental kimono and yukata in summer are also welcomed. 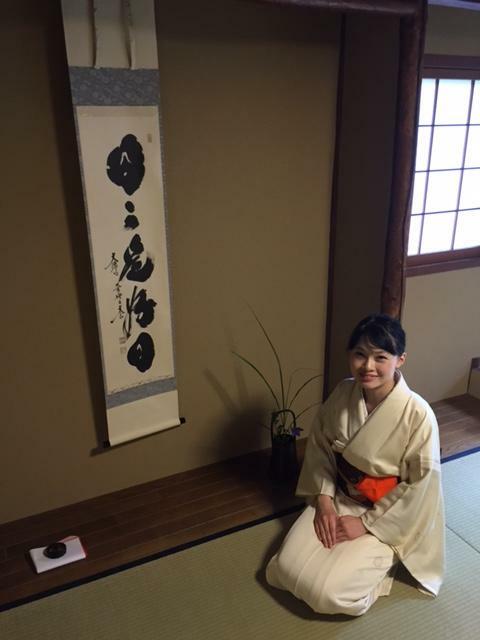 If you have put on beautiful kimono in Kyoto, it’ll be good idea to have tea ceremony. I think you can feel Kyoto, Japan more in a tea room.